Boy Scouts of America Boots Openly Gay Scout Leader Because of "Personal Agenda"
The Boy Scouts of America on Monday removed Scoutmaster Geoff McGrath, 49, who is believed to be the first openly gay adult to be barred since last year’s ballot in which the Scouts voted to accept but not gay adult leaders. McGrath told KING 5 News that he was being profiled by NBC News this week when the news outlet posted on its website that his membership had been “revoked” — information that he did not learn until he read it on the website. Chief Seattle Council leader Sharon Moulds told NBC News the Scouts did not ask about his sexual orientation and discovered he was gay only after NBC News contacted them. McGrath said it was not a “personal agenda” but simply an attempt to re-open the organization’s LGBT policy. 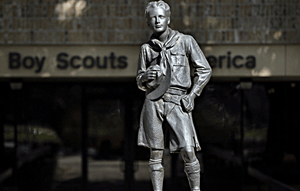 Spokesperson Deron Smith of the Boy Scouts of America has said that the BSA has no plans to revisit its policy on the banning of gay adults. This fight ain’t over yet kids.